Looking back, 2017 has been a fantastic year for reducing, recycling, and recovering food waste. Here at the IWRC, we're seeing more and more awareness and initiatives centered around the topic. Last year around this time, we looked at the food trends to gauge where food waste ranked and now, already a year later, it’s time to look ahead to 2018 and see where it sits. Luckily, the trends are continuing to show that it will be a bad year for food waste and a great year for those working towards reducing the amount of food we're sending to the landfill. To start, the National Restaurant Association creates a list that looks ahead at the end of each year called What’s Hot Culinary Forecast and I’m thrilled to see food waste has moved up to the 4th spot for 2018; up three spots from last year as it was at the 7th spot. I also noticed something regarding 2018 food trends that surprised me. While looking through lists and articles forecasting the upcoming year, food waste did not pop up as a trend as often as it did last year, however, it is in the description as a driver for multiple items on top trends lists which is exciting. The integration of food waste into trends is a positive step to reducing food waste and it came at a good time. 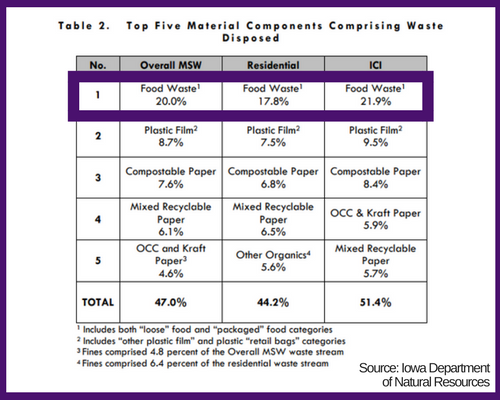 According to the Iowa Department of Natural Resources’ newly released 2017 Waste Characterization Study, the amount of food waste in Iowa’s landfills has increased by 50% since their 2011 study. Unfortunately, that means that in Iowa, 20% of what sits in the landfill is food waste. According to the results, 13.3% of the overall compostable products in the waste stream is food waste, with an additional 6.8% being food waste that is still packaged. This means food waste is still a growing issue but based on the food trends I found, it seems like we are on the right track for it to become integrated into the communities mind; instead of spreading the idea of food waste reduction, news outlets and organizations are sharing recipes and trends that are food waste inspired, and can easily be implemented. The first food trend related to food waste is Root to Stem Cooking. Root to Stem is the idea of using the whole vegetable - roots, leaves and all. This reduces any waste from the vegetable. I found this item in lists from places like Time Magazine, Whole Foods Market, and Global Food Forums. The second trend that made its way into the lists was the idea of Going Full Circle. The last food trend that will make its mark in 2018 is Upcycled Products. The transition from food waste as a single trend to inspiring multiple trends is a positive one. It can be hard to know what to do when someone says we need to reduce food waste. With the constant sharing of simple strategies and tips, 2018 will be a year to watch for food waste and see what changes take place and what habits will be broken.